Okay. What’s a WorkCamper? What’s a Workamper? And what is the difference? When this idea first occurred to us, we had no idea what a “workamper” was. It was the day of our very first open house back in August (which also happened to be my birthday.) We spent the day avoiding reality as best we could at Leo Carillo State Beach in Malibu. 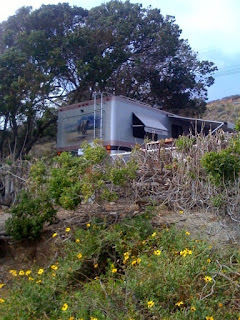 There was this RV situated in a lovely nook on the beach with an unobstructed view of the Pacific and a little wood sign that read “Campground Host.” Campground host? It had never occurred to me that there was such a thing. But of course. Why wouldn’t there be? We started fantasizing…. imagine living in Malibu ON the beach and getting paid to be there! There’s the little matter of needing to purchase a camper, however. Though I do enjoy tent camping for a night or two, I’m really not interested in living in one. And so far we haven’t landed an Airstream for free. Not yet, at least. 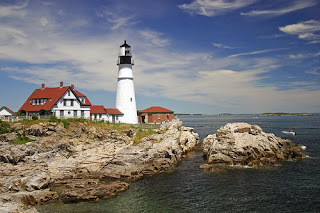 Ever since watching Pete’s Dragon as a kid, I’ve fantasized about living in a lighthouse. Who hasn’t? Did you know that you could live in one for FREE? Well, in exchange for being it’s keeper, of course. I’m really loving this idea! HOUSESITTERS of adventuresome spirit, Europeans, jet setters, retirees, caretakers. Discover unspoiled Alamos, Sonora’s city of silver in semitropical Sierra Madre Mountains. Live in 250-year-old Spanish colonial mansions. Experience a unique community. The Santa Fe of Mexico. Little theater, tennis courts, bridge club, poker, chess. 4000′ municipal airport. COUPLE, or a single person able to handle isolation, is needed on a remote southern Arizona ranch for various short-term time periods. Caretaker, cooking, housekeeping, and maintenance responsibilities. Small salary, housing and insurance provided. Biggest fear about house sitting? The Shining. I mean, it’s right there in the ad: “couple able to handle isolation“?! If that’s not a warning, I don’t know what is. Googling “Living Rent-Free” generated this intriguing and slightly scary idea- living like a pirate in NYC. There is apparently, however, a 400 person wait list! Moored in a spot about a 10-minute boat ride from Midtown, a ship has become home for a small group of secretive and resourceful people looking for an inexpensive, unorthodox place to stay. The ship is 6,000 square feet across four floors with 15-foot ceilings, and from a roof deck the size of a tennis court there is an unbroken view of the Manhattan skyline. WWOOF is a world wide network – It started in the UK in 1971 and has since become an international movement that is helping people share more sustainable ways of living. Saw a book once about a year that one of the beat writers spent up in the woods in Oregon minding a fire spotting tower. Want to find the book again, as it seemed like a great (if lonesome) gig for an itinerant playwright. I wonder if they accept fire spotters with cats? Cats and dogs do make things a bit more challenging. I’ve found a few lighthouse keeper volunteer postings but you can’t have a pet. I want to read that book. If you think of the title, post it here! Thanks, EM! Yep, that’s exactly what I thought of: live in a lookout tower as a fire spotter. I’m from the Pacific Northwest. Idaho, to be even more precise. Working as a lookout was a pretty common summer job that people in my small hometown would take. If you’re seriously interested, out here you would contact the U.S. Forest Service. I don’t know how forest management is done in the East, but maybe USFS is still your contact point. Thanks for the great post. I too have desired the campground host position. I never knew they were called workcampers. 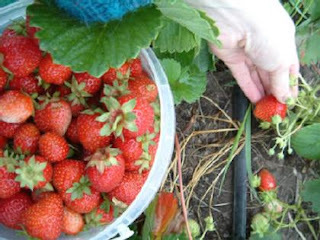 Currently, I’m looking into WWOOFing, I was wondering if you have tried it yet? I found your blog by googling: pregnant, foreclosure, Moving, death 🙁 I know, sad huh? but I’m so glad I did. My dad, my best friend died 1 year ago, when I was 9 mos pregnant..shortly after my husbands successful business took a nosedive, leaving us in massive debt…barely paying bills after having the baby, we went late on our mortgage for the 1st time ever in 5 years, spiraling an evil spill of loan hell onto us, now in foreclosure, I have sold everything we own, including my 10 month old sons crib & toys to buy us 1 way tickets to a new life…struggling in my marriage to find out yesterday, Surprise I’m 6weeks pregnant! Thanks so much for taking the time to comment and share your current situation. Honestly, reading your comment made me cry. Yes, I’m completely hormonal (I’m 29-weeks pregnant) but it was your authenticity and the difficulty of what you’re facing that really got me. I know how it feels to feel like everything is spinning out of control. You have so much on your plate right now. I hope you do keep reading the blog and find some inspiration. I wish you and your family all the best. I hope that somehow you come out on the other side better off than before. And congratulations on your new baby and your pregnancy!